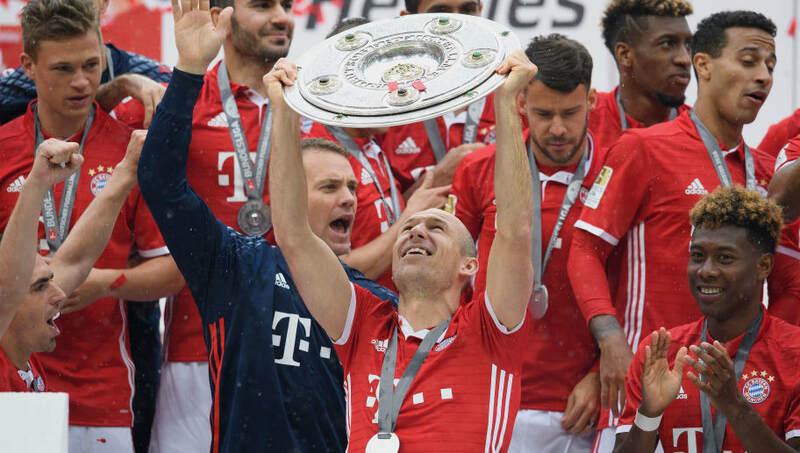 ​​Bayern Munich icon Arjen Robben has signed a new one-year deal with the ​Bundesliga outfit, committing his future to the club for a tenth consecutive season. The German giants announced the news on their ​official Twitter page, and included a photo of the Dutch dynamo proudly displaying a custom made shirt with the number 2019 to commemorate the occasion. Speaking to Bayern's official website, Robben said: “Basically, I’d already like to get started on the new season, to be honest. It was really, really painful, it really did hurt and still hurts now, that I had to go off in the Champions League semi-final and missed the second leg. The former ​Chelsea and ​Real Madrid man has excelled since joining the German giants, winning seven league titles, five domestic trophies and a Champions League trophy. Despite heading into the twilight of his career at the age of 34, Robben is still considered to be a top class player, whose exceptional technique makes him one of the best dribblers in the game. He has provided five goals and five assists in his 21 appearances this season, with Bayern cruising to yet another Bundesliga title. It is unclear whether Robben will chose to end his career at Bayern, with lucrative moves to China or MLS possible at the end of the season. He could opt instead to finish his career where it all began though - with his boyhood club Groningen.